The Bobbilicious Files: I forgot to show! 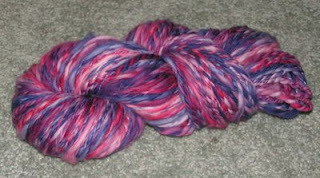 Here's a skein I spun and am proud of. It's some roving from etsy called Razzmatazz. It's not even - there are some puffier spots - but it looks like real, store-bought yarn. I need to see how many yards there are and think about what to make with it. Suggestions?? That looks great!!! It looks super soft. yummy. That would make a great hat or pair of mittens if you have enough yards.